Cream cheese is an indispensable ingredient for low-carb cooking. It provides the missing bulk in sugar-free recipes and adds a smooth, creamy texture to faux potatoes, frozen desserts, cheesecakes, frostings, and baked goods. William Lawrence of Chester, N.Y. accidentally invented cream cheese in 1872 while trying to reproduce a French cheese called Neufchatel. He wrapped his cheese in foil wrappers and sold it under the brand name Philadelphia Cream Cheese. Kraft Foods took over the Philadelphia brand in 1928 and began promoting the use of cream cheese as a versatile ingredient for cooking. Cheese dips, spreads, nut-studded cheese balls, and sandwich loaves frosted with cream cheese became the rage. “Philly” fudge, introduced in the 1950s, was one of their most popular recipes. Below is my sugar-free version, perfect for the holiday season. Line a small, shallow container (about 6 inches square) with plastic wrap for easy removal or use a candy mold. Place the cream cheese in a small bowl and mix until creamy. Add sweetener, salt, vanilla, and water and stir until blended. Bring one-half inch of water to a simmer in the bottom of a double boiler. Reduce heat so water is hot but not bubbling. Place the chocolate in the top pan and set it over, but not touching, the hot water. Stir until chocolate is melted. 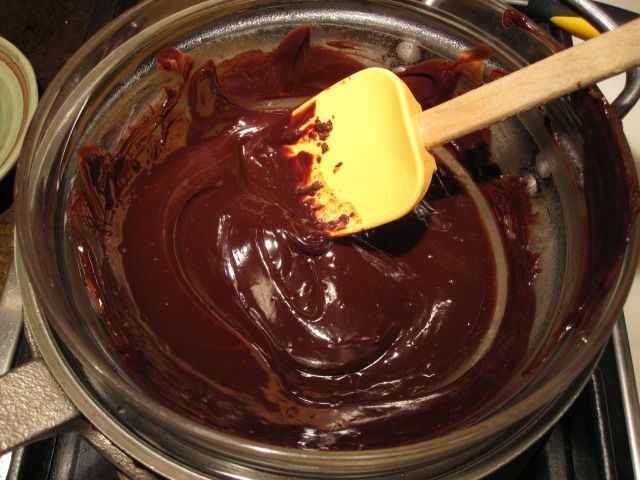 Remove the pan of chocolate from over the hot water. Scrape the cheese mixture onto the chocolate and use a heatproof spatula or a wooden spoon to work it in until it is smooth. Stir in the nuts, if using. Let cool for a minute or two. Scrape the fudge into the container. Chill until firm. Remove from container and cut into ¾-inch slices. (The candy will cut more easily before it is completely cold.) Store in the refrigerator. Makes 36 slices. Fudge, Philidelphia cream cheese. Bookmark. This sounds fantastic Judy! Thanks for sharing! I made this and it has been a lifesaver! I'm going to try adding some toasted, unsweetened coconut to the next batch. Thanks so much for sharing. Hi Wendi. I'm glad you liked the recipe. I have another fudge recipe on the blog that you might like too. It is Peanut Butter Fudge.